The International Jury for the America’s Cup levied multiple penalties on Oracle Team USA on Tuesday for modifications the syndicate made to its AC45 catamarans in 2012. Three members of the American syndicate, headed by software billionaire Larry Ellison, have been excluded from the America’s Cup Finals: Dirk de Ridder, the wingsail trimmer and a leading member of Oracle’s crew; and shore-crew members Andy Walker and Bryce Ruthenberg. Matt Mitchell, another of the team’s sailors, was barred from the first four races. 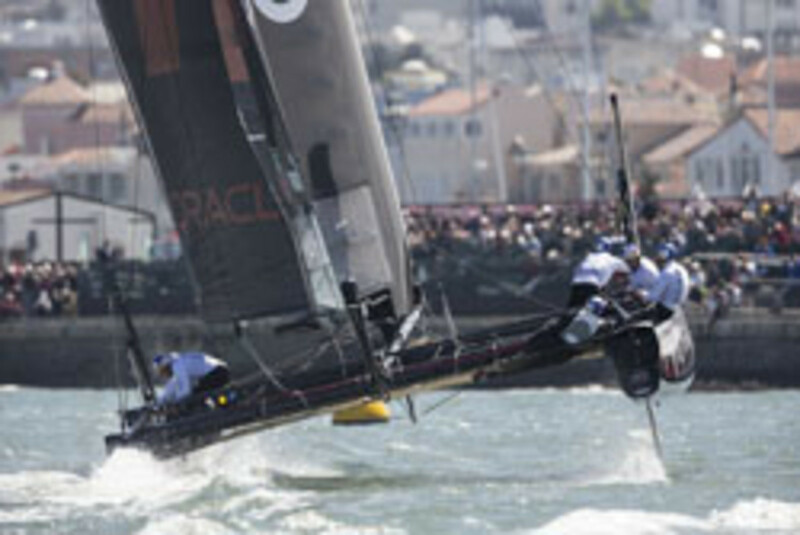 Oracle Team USA also has been docked two points in the Cup Finals, which begin Saturday, and fined $250,000. "The rules infractions involved only a few of our 130 team members and were done without the knowledge of either our team&apos;s management or the skippers who were driving the boats," team CEO Russell Coutts said in a statement. "While we disagree with the unprecedented penalties imposed by the jury, we have no choice but to make the necessary changes to personnel on our raceboat and do our best to use the next four days for the new team to practice and get ready for the start of the 34th America&apos;s Cup." The penalty was assessed because of a rules breach in early 2012 that involved modifications — adding weight and altering boat parts without the approval of class measurers — to the AC45 cats Oracle Team USA sailed in the preliminary America’s Cup World Series, not the larger AC72 cats sailed in the America’s Cup. In August, the team voluntarily withdrew retroactively from the 2012-13 regattas that involved the AC45s. The International Jury confirmed that only a handful of people were involved and concluded that all of the senior management of Oracle Team USA — including skippers Jimmy Spithill and Ben Ainslie, CEO Russell Coutts, general manager Grant Simmer and shore team director Mark Turner — were not aware or involved in any way. To win the America’s Cup a team must score nine points, the highest number in the 162-year history of the competition. However, the defending Oracle Team USA now must win 11 races to retain the trophy. Emirates Team New Zealand, the challenger, is unaffected and must win nine races. Click here for the full announcement of the ruling. The ruling is another bit of unwanted publicity for the famed regatta. In May, the Swedish team Artemis’ AC72 capsized during training with the death of crewmember Andrew Simpson. On the eve of the Oracle ruling, renowned Cup historian Bob Fisher gave a scathing interview on the state of the race and criticized the switch to multihulls. "I&apos;m a catamaran enthusiast. I think they are great boats, but they are no use to the America&apos;s Cup," Fisher told the New Zealand news outlet Stuff.co.nz.